If this calorie report on your favorite fast-food items isn't enough to make you rethink your eating habits, this story might. A photo of what's allegedly inside the McDonald's McFlurry machine has quickly made its way around the internet -- and it's quite revolting. Twitter user Nick, now a former employee of the fast-food chain, shared the photo from inside a LaPlace, Louisiana location. The 18-year-old had been working there for 5 months, according to Buzzfeed, when he made a discovery when cleaning up one of the orders. Upon taking apart one of the McFlurry machines, he noticed green gunk -- possibly mold -- was plastered inside of the trays. Since the time of writing, the tweet has been shared over 15,000 times by concerned and disgusted customers. "I thought [the machine] would be cleaned regularly," he said to Buzzfeed. However, none of the employees were ever asked to clean the trays. 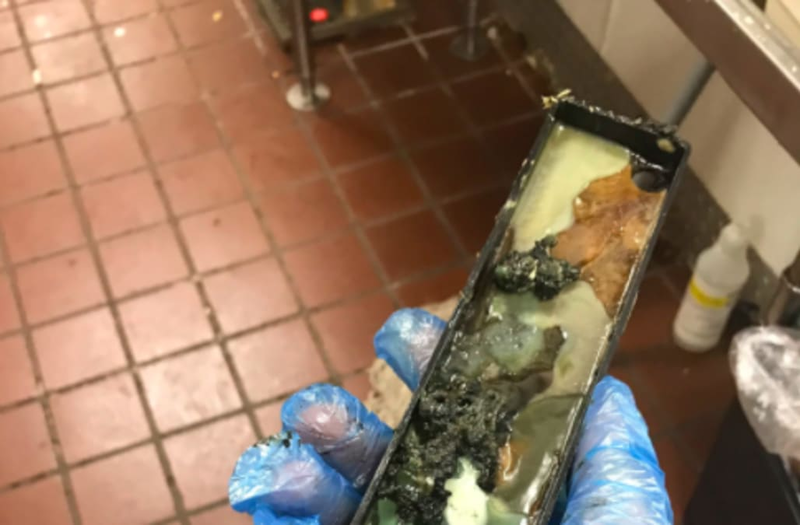 According to a representative from McDonald's, the mold doesn't come into contact with food, although it is part of the ice cream machine -- well, phew! "This is a part of our soft-serve equipment that does not come into contact with any food and is required to undergo regular and timely cleaning," the representative explained to Buzzfeed. Nick also shared cringe-worthy shots of food preparation, as seen below. After exposing the photos, Nick was promptly fired from his position and was reportedly issued a lifetime ban from the chain.